ThermX Basecoat Sealant is a brush grade caulking material that stays flexible and fills gaps and holes prior to elastomeric or paint coating on roofs or walls. It’s lightweight and very stretchy while being extremely waterproof. 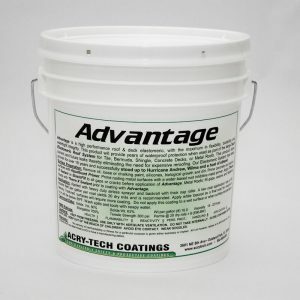 Use if to fill joints in fascia, siding, on metal roof joints, on stucco or wood to seal out wind and rain or on tile roofs as the basecoat part of a waterproofing system. 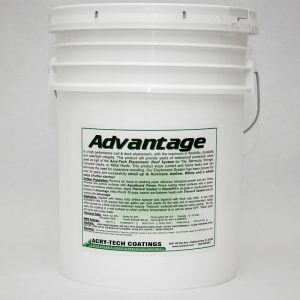 Elastomeric Sealant & Basecoat Brush Grade For Walls, or Sloped Roofs! Revolutionizing Wall & Roof Restoration! 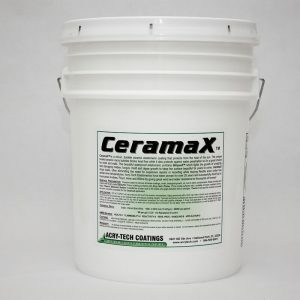 Therm-X is a totally unique, lightweight adhesive/sealant unlike hard to use tube caulk or brittle cement type patching compounds or basecoats. Therm-X will fill gaps, holes, voids and joints to provide an extremely flexible foundation on which to apply elastomeric or texture coatings or quality wall paint for long term beauty and protection to walls or roofs. 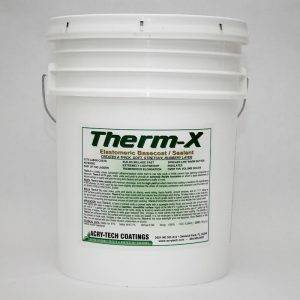 Therm-X dries quickly with minimum shrinkage. And the high yield provided means less coating is needed to fill imperfections in the substrate. On roofs, each metal panel can move slightly and displace the stress of everyday contraction and expansion over the entire roof. Therm-X fills voids, holes, joints and seams on stucco, wood siding, fascia boards, around windows, and on T-111 siding or other surfaces quickly and easily. Therm-X has High Solids and that means less shrinkage upon drying. Fill deep holes in a two coat process and smooth out providing an even texture over the entire wall. Use as a brush grade caulk to speed sealing of the project and eliminate the time consuming and expensive process of tube type caulking. 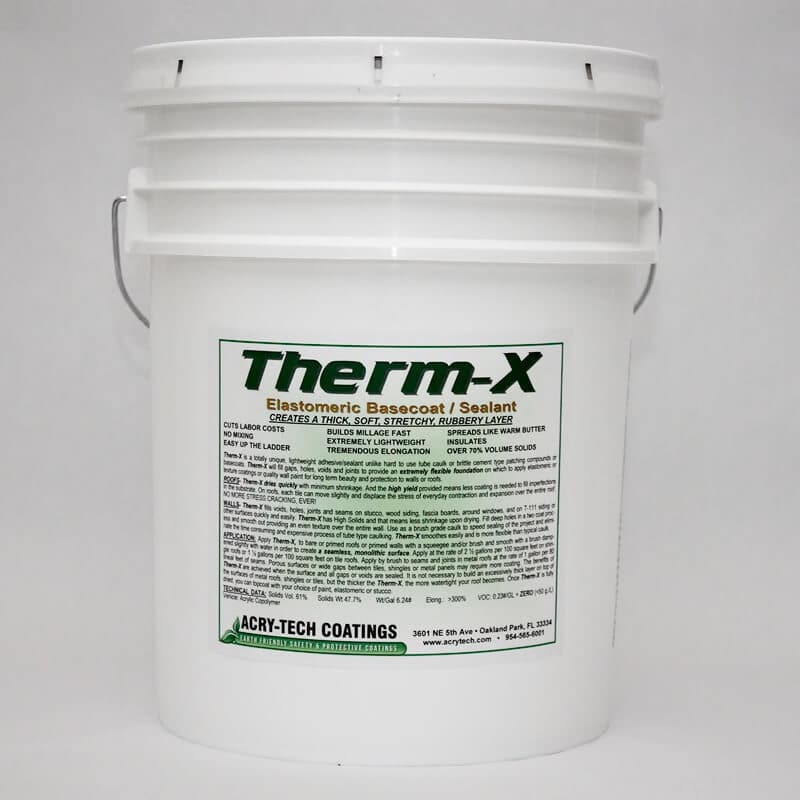 Therm-X smoothes out better and is more flexible than typical caulk for greater performance. Apply Therm-X, to bare or primed roofs or primed walls with a squeegee and/or brush and smooth with a brush dampened slightly with water in order to create a seamless, monolithic surface. The benefits of Therm-X are achieved when the surface and all gaps or voids are sealed. It is not necessary to build an excessively thick layer on top of the surfaces of metal roofs, shingles or tiles, but the thicker the Therm-X, the more watertight your roof becomes. Once Therm-X is fully dried, you can topcoat with your choice of paint, elastomeric or stucco. Clean up tools or any spills immediately with water because Therm-X dries very quickly. Clean dried material with Xylene or Toluene.